It is not uncommon for new moms to lose hair during the post pregnancy lifestage. Hair loss can be triggered by any lifestage or physical stressor that has impact on a change in the estrogen hormone balance. This would also include discontinuation of birth control pills or any other birth control method. While the rise in hormones during pregnancy keeps one from losing hair, when hormone levels return to normal hair loss can occur. This is because the hair follicles shrink during this time. As well, miscarriages, stillbirth pregnancy and abortions will have the same hair loss result. 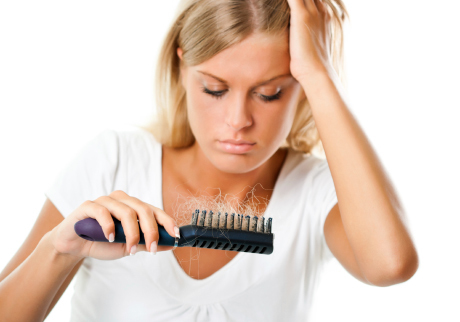 Other factors increase the potential for dull, lifeless hair, hair thinning and hair loss too. The added stress during this time of life, poor dietary habits, including lack of fresh fruits and vegetables, lack of sleep and adequate rest will compound the already compromised hair health condition. This is where KerMax can help. It targets scalp and hair follicles with its natural active compounds and advanced cosmetic delivery system. When used as directed fine thinning hair appears fuller, more radiant with more vitality and hair shaft strength. The natural hair repair process helps reduce hair loss and support the potential for new hair regrowth. As well, unlike over the counter drug options KerMax is a safe and reliable product with no known side effects. It will not interact with any medications and has no impact on breast milk production or quality.